Answer: I'd like to start off the week discussing the merits and issues associated with putting lids on terrariums. TL:DR Answer: lid your terrariums for 75-85% of the time. Nesting Ranch, I see that some of your terrariums are lidded and some were not. Many terrarium vessels come with lids (candy jars, apothecary jars) but most do not. I would encourage anyone with an open top terrarium to find a way to partially or fully cover the terrarium 75-85% the time. The larger the ratio of vessel opening to vessel volume, the more necessary lidding the terrarium will be. The lid helps maintain the humidity levels in the terrarium - which is necessary for most terrarium plants (mosses and ferns). A fishbowl-type vessel is losing most of its humidity right through the opening in the vessel. A wine bottle terrarium maintains humidity levels due to its small opening. Ideas for lids: plexiglass, acrylic plastic sheets, small dishes or plates, tin foil, lids from other vessels. With that said, you must uncover the terrarium for short periods of time - perhaps one day a week. Outdoor ferns and mosses benefit from air circulation in addition to humidity. You must allow this same air circulation for your terrarium plants occasionally. This prevents plant rot and fungus growth as well. But every terrarium is its own ecosystem. It takes some experience with "settled" terrariums to learn to watch the moisture accumulation on the glass as a gauge for how frequently to cover/uncover the lids. If you see water droplets on more than 50% of the interior surface you should unlid for a day. If the soil layer in the terrarium appears light and color and completely dry you need to consider lidding the terrarium more frequently. 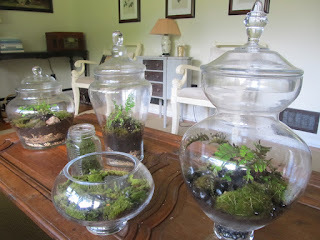 Read more about lidding terrariums here. Thanks for the tip, Amanda! I will definitely share this link in a post.